Japan's PM Abe: "I Want Next Governor of Tokyo to Be A Young Woman"
Well, as if it would be his to decide. The gubernatorial election to be called early next year in Tokyo is a local election, albeit an important one if only because Tokyo is the most populous prefecture in Japan. In case you haven't heard about it, Tokyo Governor Naoki Inose, who won the election in December last year with a landslide (he amassed the largest ever number of votes in the Tokyo gubernatorial election) and won the 2020 Olympic for Tokyo, suddenly found himself a target of the suddenly righteous press in Japan (who have all but stopped coverage of the State Secrecy Protection Law as soon as it passed the Upper House), and has been forced out of office. Mr. Inose's sin? Having received a "huge", no-interest campaign loan (50 million yen, or 500,000 US dollars) from a hospital chain that provided campaign funds to a host of other national politicians, many of them in Liberal Democratic Party in the December 2012 Lower House election/local elections. Mr. Inose did an extremely poor job of explaining away (he miserably failed), and for that small amount, as far as the politics go in Japan and which he claims he has returned, he resigned on December 19, 2013. Is the righteous mainstream (national) media in Japan going after the national politicians in the ruling party? It's not that I think highly of Mr. Inose (I don't), but the way the mainstream media (particularly Asahi, who had a "scoop" - sure, sure) and LDP blew it out of proportion from a potential bribery case into a circus is highly suspicious. Now that Mr. Inose has resigned, all is well, the case closed, not just for Inose but most likely for any politician who received money from the hospital chain. Mr. Inose's word says it all: "I was a politically naive amateur." According to the source connected to LDP, Prime Minister Abe was telling his staff that the candidate for the Governor of Tokyo should be a young woman. Young woman. Meaning someone (or a whole lot of them) like these, Abe's favorite, dressed in a school-uniform-like outfit (you are supposed to see them as high school girls)? 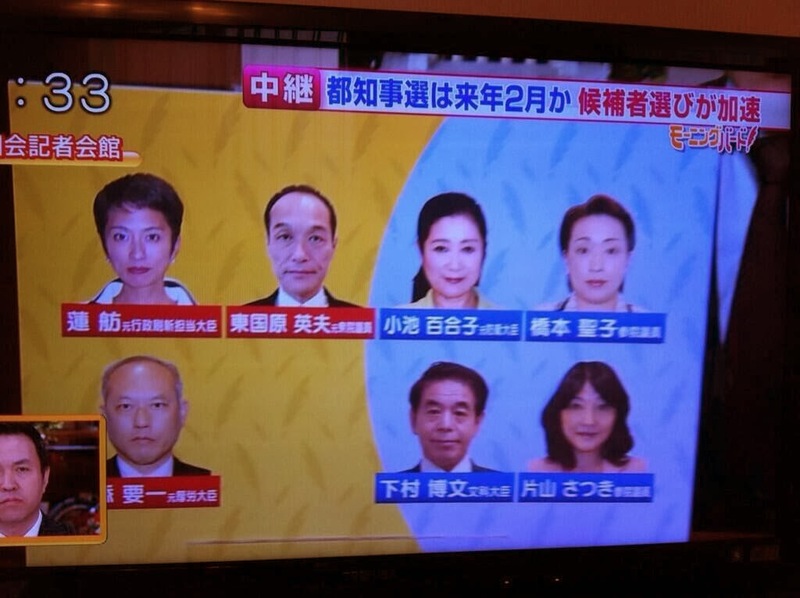 Candidates with yellow background color are from the opposition, blue from LDP. They don't even look human, but four out of seven are girls. Not sure about "young". Anyone young could probably do a better job, regardless of gender. Maybe we can have our first Tokimeki Governor ™. Sounds like Abe wants Japanese version of Sarah Palin and Michelle Bachman .... but never ever Elizabeth Warren or Jill Stein. Thanks always for your excellent report. Er, on which basis is 50 ml yen a small sum? By the way, my impression is that Inose failed to persuade that he did not use the funds for the campaign. Now that the men have created a huge radiation problem for Tokyo of course they want a young lady to take over so that later they can announce the truth as if she was hiding it. Abe wants the Japanese version of Miley Cyrus, not Palin or Bachman or anyone over 40 if not 30. Less naughty perhaps. 50 million yen, or 500,000 USD, is probably enough to buy a "mansion" (high-rise apartment unit) in Tokyo, probably not the central Tokyo but close enough. That's not much, but that could just be me, born and grown up in Tokyo. As far as the political world in Japan goes, people start to raise eyebrows when the amount exceeds 100 million yen, or "ichi-oku en". And I though American politicians were wackos - this takes the prize. Inose was vice of Ishihara and the latter supported him at the elections. Is there any chance that Ishihara too might have been involved into similar ways of running for office? Precisely... most people enter into a 35 years housing loan to buy a 50 million apartment. It's about a lifetime savings. By the way, Inose cashed 10 million as retirement allowance after he resigned. It's still not much by the standard of Japanese politics. Unfortunately for Inose, the amount is just about the right amount most people can relate to and get outraged. A beauty contest is just what Japan needs right now.A pretty new leader would help take their minds off all those Fukushima problems. True, Ozawa got into trouble because of a few hundred million but still 50 ml is no pocket change. Some other politician got in trouble for "foreign" donations... turned out he got 200.000/300.000 yen from a third generation Japanese-Korean old lady (if I recall correctly). I would call this donation irrelevant, but 50 ml is another story. Let's put it this way, those girls on stage are looking rather the much more attractive than America's newest candidate for president. The one referred to as "this thing", Pajama Boi, FlannelJammies, etc. Care for a reminder of how the Japanese govt. has betrayed its people? Now they fully back spreading Fuku-food everywhere in Japan.